The artwork for the long-gestating collaboration between the Wu-Tang Clan and The Lox (a.k.a. 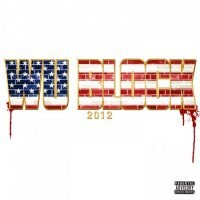 “D-Block”) is a strong addition to the list of American-flag themed hip-hop album covers. I like it! (Though, as might have been expected, it looks like some red paint has been spilled in the printing process.) The first single from the album, which comes out next month, is called “Stick Up Kids.” Lox MC Sheek Louch and the Wu’s Ghostface Killah always sound good together on records. Their voices share an adenoidal whine that bestows an emotional element so often lacking in rap. The track was produced by Miami-born producer Andy “Red Spyda” Thelusma (whose other nickname is “Rush,” just like Def Jam Records founder Russell Simmons and the Canadian prog-metal trio of Geddy Lee, Alex Lifeson and Neil Peart.) I love those Zarathustrian timpani drums.